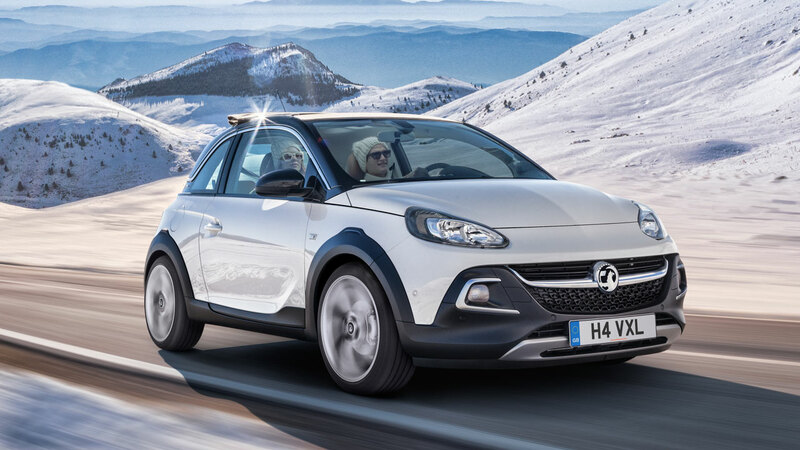 The latest edition to Vauxhall’s city chic ADAM range was previewed as a concept at the 2013 Geneva Motor Show and after receiving a rapturous reception the production model is poised to make a show-stopping debut a year later. Compared with other members of the ADAM family, ROCKS is taller, wider and tougher in appearance, while also offering a full-length electric folding canvas roof. 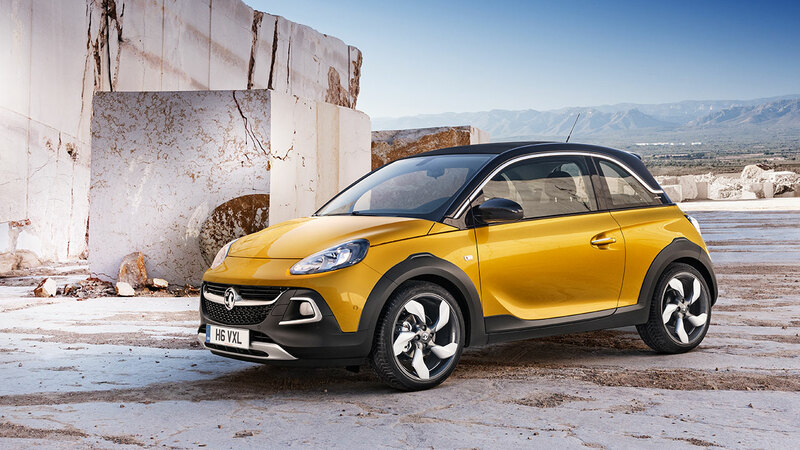 ADAM ROCKS’ new crossover body style is supported by a chassis that is raised 15mm with a wider stance. Agile parkour athletes, who move from one place to another, negotiating urban obstacles in between, were the inspiration for this sporty crossover concept. Parts of the chassis system have been modified or re-tuned – including dampers, springs, the rear suspension geometry, and steering. The higher, wider looks are matched by a choice of 17-inch or 18-inch alloy wheels. These can be further personalised with new wheel clips in “Wild” design and different colours that are unique to ROCKS. Protective, anthracite-coloured cladding is wrapped tightly around the ADAM ROCKS, giving it a tough, muscular look. The front trapezoidal grille, with a chrome central brand bar, is embedded in the cladding, while contrasting, satin chrome ‘boomerang’ elements frame the front fog lamps/indicator housings and the reversing/fog lamps at the rear. An integrated rear roof spoiler and LED daytime running lights also come as standard. Silver skid plates front and rear and a bold chrome exhaust complete the exterior design. New exterior paint colours will be introduced with ADAM ROCKS, starting with the vibrant yellow Goldbusters. ROCKS combines its rugged individuality with open air fun. The electric folding canvas roof is operated via a button located in the front area of the headliner and folds back neatly on to the C-pillars in just five seconds. Creating a wide opening into the sky, this stylish system has no negative impact on body stiffness or on the car’s functionality: the boot keeps the full opening of a hatchback and loading volume remains untouched. The entire roof module is acoustically tuned for noise insulation inside the cabin, and the robust, three-layer fabric has a neoprene centre for weatherproofing and durability. The folding canvas roof is available in a choice of three exterior colours – Black, Sweet Coffee or Light Oak – that combine with the different roof colours of the ROCKS. ROCKS’ cabin reverberates with its own distinctive character. Two new, exclusive ROCKS interior trims have been designed. They include a main instrument cluster, seat and door panel colours and other trim elements – all unique to Vauxhall’s urban chic newcomer. 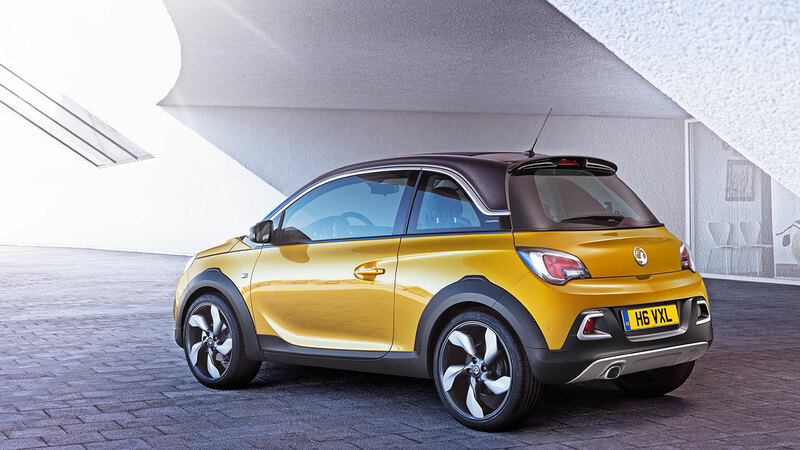 One trim is taken directly from the ADAM ROCKS concept car revealed last year: it has elegant-sporty Peanut-coloured fabric/Morrocana seats and door panels, leather steering wheel, gearshift and handbrake in the same colour, and a “Surf” décor trim. The other features a sophisticated Coffee Bean design – rich dark brown seats in a black cabin trimmed with bright blue stitching. 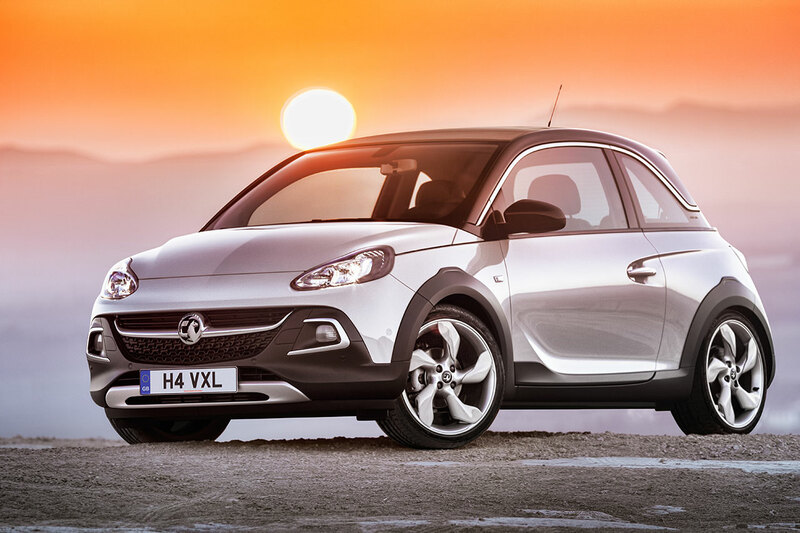 ROCKS is the first model to feature Vauxhall’s all-new 1.0-litre ECOTEC Direct Injection Turbo three-cylinder engine. This high-tech pocket rocket raises the bar for three-cylinder engine refinement and packs up to 115PS, with impressive low-end torque of 166 Nm. Contributing to the overall efficiency of the all-aluminium engine with a single scroll turbocharger include direct injection, variable valve timing, a switchable water pump and an integrated exhaust manifold. Fuel-saving Start/Stop technology is an integral part of the system and offered as standard. The new 1.0 ECOTEC comes with a choice of two power outputs, 90PS and 115PS. Both versions of the new three-cylinder powerhouse are mated to an all-new six-speed manual gearbox with a compact package design. During its development, focus was on efficiency (thanks to reduced friction) and benchmark shifting: gear change is comfortable, precise and smooth. The new engine tops a powertrain portfolio including ADAM’s three current four-cylinder naturally-aspirated units comprising a 1.2-litre engine with 70PS and a 1.4-litre available in two power outputs, 87PS and 100PS. 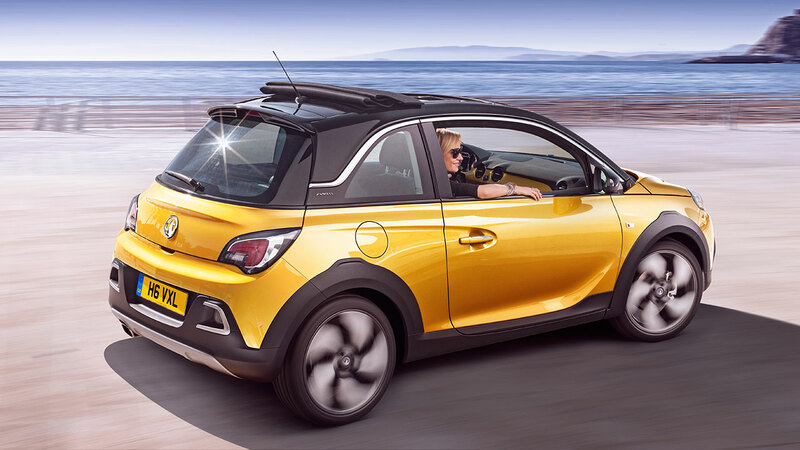 Like its ADAM siblings, ROCKS is one of the best connected small cars around thanks to its state-of-the-art Intelilink infotainment system. Priced from just £275, it allows seamless integration of Android as well as Apple iOS smartphone functionalities into the car. It provides USB and Bluetooth connectivity, audio streaming, a seven-inch high-definition colour touch-screen and seven speakers. Clever apps including navigation BringGo, Stitcher and TuneIn can be downloaded. The integration of Apple iOS devices into the system enables Siri Eyes Free voice control. This makes it possible for drivers to have incoming text messages read aloud and to dictate messages while they keep their eyes on the road and their hands on the steering wheel. ADAM ROCKS pricing will be announced when it goes on sale in the summer. Production is due to start in Eisenach, Germany in August.